While the MCD bulldozers inched ahead to shatter their expensive outlets, the fashion frat screamed blue murder. Despite pleas and explanations and “valid documents”, they could not prevent the men and machines from doing their job, razing their well-crafted niches. 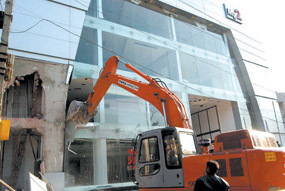 A building on 2 MG Road being demolished in the Capital on Friday. The Delhi High Court today refused to stay the ongoing demolitions of showrooms on MG Road, including those of some well-known designers. 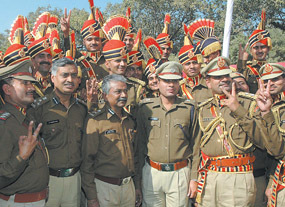 SPLENDID VICTORY: Senior Delhi Police officers flashing smiles and V-signs after becoming the Best Marching Contingent, Republic Day 2006, at a function in the Capital on Friday. The beleaguered Municipal Corporation of Delhi (MCD) today got a mild reprieve after the Delhi High Court refused to issue any interim direction on a PIL which sought immediate dissolution of the civic body in view of its alleged involvement in various acts of omission and commission. Taking note of piling up electricity related disputes, including those pertaining to power thefts in the Capital, the Supreme Court today directed the Delhi High Court to set up five additional courts to exclusively deal with such cases. A joint operation, involving BYPL Enforcement Teams and 15 policemen from the local police station, conducted a series of raids in the highly theft-prone area of Karawal Nagar in East Delhi and unearthed power theft of over 157 KW, amounting to over Rs 1 crore. Delhi today continued its journey towards summer as there was a further rise in the minimum temperature in the Capital. Delhi Government has decided to make proper use of vacant Gram Sabha land in Delhi. This decision was taken in a meeting held under the Chairmanship of Delhi Finance and Planning Minister Dr. A.K.Walia. Jamia Millia Islamia University recently held a 3-day workshop on the ‘rights of the child’. This rather pertinent workshop was held jointly with ‘Save The Children, an NGO from Sweden. Delhi Chief Minister Sheila Dikshit today inaugurated a newly built Girls Hostel at R.K.Puram, which would provide accommodation to working girls who come to Delhi from other states. Noida Police has arrested two auto lifters from Dadri area and recovered three stolen vehicles. Four persons of a family committed suicide after consuming pesticide this afternoon in Dariapur village in the area of Jafarpur Kalan in southwest district. The victims include Rajender (40), Sapna (18), Rekha (15) and Narender (12). Delhi Police have arrested four persons after a brief encounter. The four accused have been identified as Vikram, Manish, Kamal and Kuldeep. Vikram is a native of Ajmer while the other three are of Delhi. While it was 1 MG Road that saw a posh building demolished, today was the turn of 2 MG Road, another shopping Mall, where designers sell dreams. The demolition was carried out in the presence of a huge posse of policemen. Even as the designers claimed that they were not the “big fish”, the police was called in to ensure that the demolition work at the mall went on without any glitches. Both 1 and 2, M G Road are destination of Delhi’s elite, where they splurge on the designs of some of the best-known names in the industry, from Rohit Bal to Mandira Wirk, from Ashima-Leena to Rana Gill. While the mall on 1 MG Road came up in 2001, the adjoining sprawling complex on 2 MG Road became operational in 2004. The MCD says that once the demolition work at both the malls is accomplished, it will proceed to demolish other shopping centres that have come up in the ‘Lal Dora’ areas over the years. The MCD’s move to demolish the malls has come under fire from several leaders. They will hold a protest at Rajghat on February 5 to protest against the demolition drive in the Lal Dora areas. Leaders from the entire political spectrum of Delhi have also demanded implementation of the Mukesh Sharma committee report constituted by the Delhi Assembly. The leaders said all the Delhi MPs, MLAs, Municipal Councillors, top political leaders and presidents of political parties had been requested to participate in the February 5 dharna. Delhi Chief Minister Sheila Dikshit had also been requested to attend the dharna, they said. The Division Bench of Justice Vijender Jain and Justice Rekha Sharma, however, granted the aggrieved showroom owners of MG Road in the ‘Lal Dora’ area an option to file a separate suit against the MCD for compensation, since it was alleged that the civic authorities had accorded them sanction illegally. Appearing for some of the petitioners, senior counsel Sandeep Sethi pleaded that the court should immediately intervene and stop the demolitions, since the buildings were all constructed before 1999. He contended that the owners had gone ahead with the construction of the buildings, after being given to understand by the MCD Town Planning section that there was no such embargo on the construction of commercial structures in the ‘Lal Dora’ area. He pleaded that it would cause huge financial loss to the petitioners if the buildings were allowed to be razed for faults committed by the MCD. The Bench, while maintaining that it was always an unpleasant decision to order the demolitions, said it was inevitable as the rule of law had to prevail in the Capital “to make it a beautiful place to live”. “We cannot allow mafia and muscle-power to rule the city,” the court added. It reiterated that it was determined to preserve the rural character of the ‘Lal Dora’ areas and hence would not tolerate any type of commercial activities at the locations. The matter has been posted for further hearing to February 16. Those protesting against the MCD demolition drive have found a sympathiser in former Delhi Chief Minister, Madan Lal Khurana. Back into the party national executive, the BJP leader has announced his intention of opposing the demolition drive. Demanding a central ordinance to stop the MCD bulldozers, Mr Khuarna is reported to have requested the Prime Minister, Dr Manmohan Singh, to regularise all illegal buildings on the MCD list, through an ordinance. “I have written to the Prime Minister requesting him to bring in an ordinance, like the one passed by Maharashtra government to regularise Ulhasnagar buildings to save Delhi from bulldozers,” Mr Khurana said. In his letter, Mr Khurana also urged the Prime Minister to confer the status of full statehood on Delhi at the earliest. He blamed the “internal politics of Congress” for the predicament that the National Capital finds itself in. Pointing out that he would go to any extent to stop the MCD from further demolitions, Mr Khurana said former minister of Delhi, Harsharan Singh Balli would go on an indefinite hunger strike from February 7 to register protests against the Sheila Dikshit-led government. The People’s Action Group has alleged that the MCD has adopted discriminatory stance between politicians and general people while demolishing unauthorised constructions in Delhi. The people in general who own such buildings were not given any notice before the demolition action while properties of politicians were first surveyed, and then issued notice. They were given adequate time to discuss with lawyers. They submitted their responses after discussing with experts. General secretary of the People’s Action Col. (retd) D. K. Shandilya said that the High Court’s order was for unauthorised construction irrespective of the status of the owner of the building. The court even targeted the buildings of politicians and other big fish first. But the MCD has destroyed the business establishment of ordinary people. “Councillors and MLAs go off scot-free while others are being punished,” convenor of the group, Ajay Jain said. “This farce has to stop. Politicians must be targeted first if these demolitions are to serve any purpose. The MCD officials who have allowed these constructions have to be nabbed next,” said Sanjay Kaul, president of the People’s Action Group. A Division Bench of Justice Vijender Jain and Justice Rekha Sharma, while refusing to pass any interim direction on the matter, posted it for further hearing on February 16. The petition, filed by an advocate, sought a direction from the court to the Centre for dissolving the civic body on the ground that it could not be run in accordance with the provisions of the Corporations Act. The petition alleged that taking undue advantage of the panic that had gripped the city on account of the ongoing demolitions, MCD officials were extorting about Rs 25 to 30 lakh every day from aggrieved building-owners, with the promise that their premises would not be razed. He produced several newspaper clippings to substantiate his claim. However, the Bench asked the petitioner to furnish before the court specific details of such instances so that necessary action could be taken. The Bench observed that no law or enforcement could be effectively taken up unless there was a wholehearted co-operation from civil society. The electricity courts had to be set up in Vikaspuri, Rohini, Malviya Nagar, Vazirpur Induatrial Area and Patpargunj Industrial Area in addition to two already set up on the apex court’s direction in 2004. A Bench of Justice Ruma Pal, Justice A R Lakshmanan and Justice Dalveer Bhandari also asked the High Court to appoint judges to man these courts within two weeks and for the time being, they will function from the existing courts at Rohini, Karkardooma and other places. The construction work for these courts at Vikaspuri, Rohini and Vazirpur was already under way and the apex court directed the High Court to consider proposal for setting such courts at Malviya Nagar and Patpargunj in two weeks. It asked the power distribution companies NDPL, BSES Yamuna And BSES Rajdhani which were assigned the job of constructing theses courts at Vikaspuri, Vazirpur and Rohini to finish the job in two months. The court had in 1999 taken suo motu cognizance of acute power crisis in the city and issued notices to the Delhi Government and other authorities concerned, including three private distribution companies. On the plea of the power distributing companies that police were not assisting them in checking power theft despite a specific direction in the 2004 order, the Bench sought opinion of Delhi Police Legal Department by the next date of hearing. Delhi Police had stated that under the existing laws, it could not take cognizance of power thefts and register cases against the offenders. On the issue of inadequate electricity supply, the court asked the Delhi Government and Delhi Transco to file affidavits in four weeks about difference between generation and availability of power in the city. Amicus Curiae Ranjit Kumar, appointed by the court to assist it in adjudicating the complex issue, complained that the city was facing 60 to 90 minutes power cut every day. He said the electricity demand during peak hour was 3800 MW while the projected demand during normal hours was 3500 and that then city had less power than it actually required. The joint operation, meticulously planned and involving a total of six teams, raided four complexes, including an industrial unit manufacturing plastic moulding products and a 20-room residential complex. According to a BSES official, the industrial unit, at Chairman Market, Khajoori Khas, engaged in manufacturing plastic moulding products did not have a meter and was found to be stealing electricity worth a whooping 100 KW, from the nearby BSES LV mains. The 20-room residential complex, fully occupied by tenants at Gali No 1, Khajoori Khas, did not have an electricity meter either and was found to be stealing electricity worth over 50 KM from the nearby BSES LV mains. In the two other raids, people stealing between as little as 1.11 KW to 6 KW were also raided. They were also found to be indulging in power theft, from the nearby BSES LV mains. The cumulative theft booked at over Rs 1 crore. An FIR is being lodged. These offences carry an imprisonment of up to three years, fine or both, he added. A day after a cool breeze heralded the ‘’arrival of spring’’, the minimum temperature rose to 12 degree Celsius, from 11 degree Celsius yesterday. With the maximum temperature too rising to 27 degree Celsius, from 26.5 degree Celsius yesterday, Delhi’s march towards summer seems irreversible. The warmth in the air is evident from the fact that the minimum temperature of 12 degree Celsius recorded today was almost three degree above normal while the maximum of 27 degree Celsius was five degree above normal. The last few days have witnessed a trend of ‘’warm days and pleasant evenings’’ as the mercury has seen a steady rise over the last week. In fact, at 12 degree Celsius, the minimum is much above the 4.7 degree Celsius recorded last week while the maximum has also risen sharply from last week’s level of 22.0 degree Celsius. The rise in the temperature in the Capital is in keeping with the trend in the plains of North west India where there has been an appreciable rise in the mercury in many areas in the last few days. The status of Gram Sabha land in North west District was mainly discussed in today’s meeting. It was reported that nearly 8250 bighas of Gram Sabha land in 75 villages of the district is presently vacant and lying unutilised. Dr Walia has directed Revenue and Environment departments to jointly prepare an action plan for development of greenery as forest on vacant land to avoid encroachments. The Minister has also instructed the Divisional Commissioner to instruct all other districts to take up similar exercise on priority. He added that this would help in expanding the forest cover in all parts of Delhi. He asked North West District to take lead in this direction as more than 60 sites on Gram Sabha land varying from 120 to 600 bighas are vacant which could be developed as beautiful green belt in this thickly populated Capital city. The workshop was held between January 19-21 for the benefit of faculty members and resource persons who would be holding classes in a novel new diploma on Child Rights, which has already begun at the university this February. This workshop was the first among a series of capacity building inputs planned as part of the long term capacity building process required by the academia on child rights. Faculty members from different departments in the university participated. Jamia is also developing a Child Rights resource center in the department of social work. The university had earlier announced a Post-Graduate Diploma in Child Rights. This course is being started under the Department of Social Work and in partnership with ‘Save the Children’. The university has decided to begin this course after considering at length the dismal condition of children in India, especially the girl child. Child Rights is an issue which is increasingly gaining importance among concerned sections the world over. Almost, all international development agencies stress on the importance of using a right’s based approach in working with people, especially with children. Further, there is also a growing demand within India and in the international fora for trained professionals conversant with the language and techniques of the rights based approach. This post-graduate diploma course in child rights is a one year course and is open for graduates who are working in the area of social welfare, social development and also to fresh graduates who wish to acquire an advanced skill. The course is divided into two semesters, each of 20 weeks duration and in each semester there would be four papers. Each paper is planned in such a way that it will be covered over 60 hours and an inter-disciplinary approach will be used including lectures, presentations, discussions, group and individual assignments etc. The classes for the course will be held in the evenings on weekdays and in the daytime on weekends. Currently, the present course intake is of 40 students only and reservation of seats as per the Jamia policy is applicable. The first session for the course begins this February. Interestingly, the tuition fees for the course is sponsored by ‘Save the Children’, which will pay Rs 10,000 per candidate and students will only be expected to fill a nominal fee. The course-content specifically focuses on Understanding Children and Society, Situational Analysis of Children in South Asia and Methods of Working with Children. Indian Council of Social Welfare has helped construct the hostel. A sum of Rs 25 lakh was released for this purpose by the Lok Kalyan Samiti, Government of Delhi. Ms Dikshit said that her government would strive hard to provide better social security to elders and other deprived persons of society. She called upon people to render constructive cooperation in implementing various welfare schemes as government alone would not be able to face the challenge. Stressing upon the need for proper maintenance in the working girls hostel, she added that her government has drawn up a comprehensive programme for empowerment of women and has been organising Stree-Shakti Camps in different parts of the Capital to provide useful information on health and self-employment. During routine night patrolling on Thursday night, Dadri Police team nabbed two persons from Maruti car. They were identified as Kithore and Aslam, residents of Mawana. On detailed interrogation, they revealed they were members of auto lifting gang. Two cars stolen from Meerut were recovered on the clues provided by them. The gang has been acting in Noida and surrounding districts for the last few years. While the police are still investigating the matter, initial probe revealed that the victim Rajender was suffering from financial crisis. Police officials said that the marriage of his eldest daughter Rajni was scheduled next month and he had been tense for a long time for want of money. Santosh, the wife of the victim Rajender and his eldest daughter Rajni survived as they were at home. Police said that Rajender today took his son Narender and his two daughters to the fields to help him. There he administered pesticide to his three children and thereafter killed himself by consuming pesticide, said the police. The police got the information at about 1 pm. The bodies have been sent for postmortem and a case has been registered in the local police station. Police said that the accused belong to Dhan Singh gang and were allegedly involved in various criminal activities, including dacoity, murder and attempt to murder.